Underwood Briarwood Three Module with Jewellery Case. 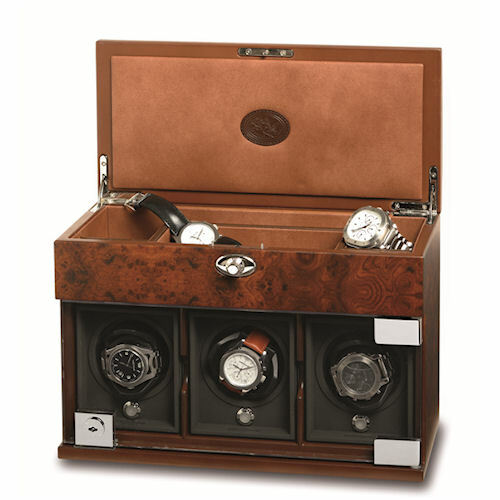 The Briarwood collection offers everything from a single watch winder case to a Twenty Module Cabinet. 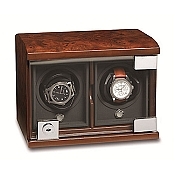 The Underwood Briarwood Watch Winder - The Three-Module with Jewelry Case is a three module watch winder box with storage for jewelry on top. This luxury wooden triple watch winder is housed in a beautiful briarwood veneer and features a protective sliding glass door with lock. The upper compartment stores cufflinks, rings, and other jewelry items. The Underwood Briarwood Watch Winder - The Three-Module with Jewelry Case stores and protects up to three of your expensive automatic watches. The winder modules are powered by batteries or AC and uses reliable Swiss Maxon motors. It includes a leather cover for travel. 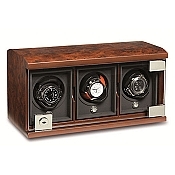 This reliable Briarwood three watch winder is also an exquisite decorative accessory. 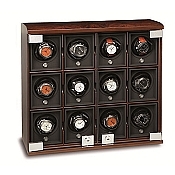 The Underwood Briarwood Watch Winder collection offers everything from a single watch-case to a Twenty Module Cabinet. Briarwood watch cases are also available. This exquisite selection of handcrafted cases finished in a veneer of Briarwood is the most elegant way to display and maintain your automatic watch collection. 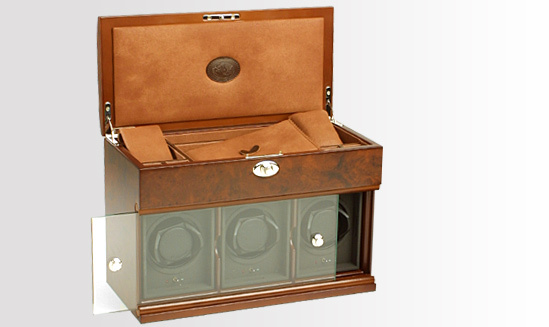 The Underwood Briarwood Watch Winder collection is both elegant and reliable. Underwood watch winders are fully automatic, with no adjustments needed. Just place your watch on the spring-loaded mount mechanism, insert the mount into the module and turn on the unit. The unit will rotate 30 minutes clockwise, then 30 minutes counterclockwise, after which it will stop for three hours. It will then repeat this cycle. The result is a 24-hour cycle, making the Underwood watch winders ideal for all automatic watches, whether modern or heirloom. Each Underwood module operates on AC or battery power. And each multiple winding box comes with an extra single-unit leather carrying case. So you can use your Underwood winder at home, in your office or on your next trip-even protect it in a safe. With the Modular Winding System from Underwood, you can build your system as your automatic watch collection grows. Each single unit works independently even when housed in one of the Underwood multiple-unit boxes. 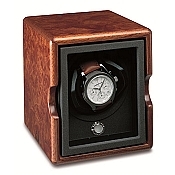 Your Underwood watch winder is housed in the finest materials. The single module protects your watch in a durable, smooth finish, high-tech coated, abrasion-resistant composite material. Following the long tradition of Underwood fine leather accessories, the luxurious leather cases are handcrafted in Italy from carefully selected full grain, natural vegetable-tanned leather. Each case is accented with solid brass fittings decorated with the 'Clou de Paris' found on all Underwood products.